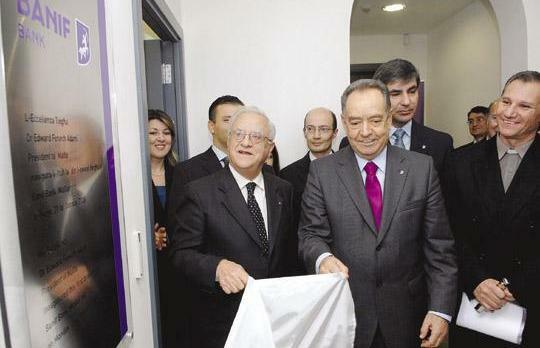 President Eddie Fenech Adami (left) and Banif Financial Group chairman Horácio Roque during the official opening of the Banif Bank branch in St Julians yesterday. Photo: Matthew Mirabelli. Unveiling its first branch in Malta yesterday, the Portuguese Banif Bank is already projecting that it will have up to 25 more branches within five years and secure 10 per cent of the market. Situated in Main Street, St Julians, the branch, a freshly painted building bearing the white and purple colours of the bank's emblem, was inaugurated yesterday morning by President Eddie Fenech Adami. Banif Financial Group chairman Horácio Roque flew in especially for the ceremony, which was attended by Banif Bank (Malta) chairman Joseph Sammut and the bank's chief executive officer Joaquim Silva Pinto. The bank has four Maltese minority shareholders - Mizzi Group, Virtù Investments, P&G Group and Sak Ltd - which will hold a position on the board of directors. The bank has already employed about 40 people. Aware of the hold that HSBC and Bank of Valletta have on the local banking sector, group vice-chairman Duarte de Almeida said Banif felt there was space for a third main retail bank. "The market in Malta is a mature one, which is consistent and very profitable. We think we can give value and a personalised service to clients," he said. Commendador Roque said Banif Bank (Malta) will strive to become a key player in the Maltese market by capitalising on the knowledge and expertise gained from other countries with the same economic and social characteristics of Malta, like the Azores and Madeira. He said it was still too early to say if the bank will be present on the Malta Stock Exchange. The bank says it will offer fully fledged financial services through a differentiation strategy based upon high quality of service, with an innovative product portfolio and advanced banking technology oriented towards efficiency gains, with the aim to bring more prosperity to the Maltese market. The bank's initial priority is to create a strong business structure based on solid internal processes. The next step will then focus on new customer acquisition and cross-selling, which would lead to network expansion and increased market share. This would enable the bank to consolidate itself and focus on improving the financial well-being of its loyal customers, it said. Founded in 1988, the Banif Group has total assets of €10.3 million and employs 4,500 people in 450 branches, including 57 insurance offices. Its more than one million clients represent an overall market share of around 3.6 per cent of the Portuguese financial services sector. Profits for the first nine months of last year stood at €64.7 million. In Madeira and the Azores, the bank has a market share of 26 per cent and 34 per cent respectively, making it the market leader in those islands. "The recent A-2 rating by Moodys and the election of Banif as one of the leaders of the future by Standard & Poor's, encourages us to go even further," said Commendador Roque. Internationalisation has been a core element of the group's strategy over the last few years, not only by leveraging the Portuguese community presence in the world but also by creating an adequate platform for the sharing of banking and insurance competencies. Banif Bank has a presence in London, Brazil, Miami, Newark, Toronto, South Africa, Bermuda, and Spain among others. Describing Malta's relations with Portugal, Mr Sammut said these dated back to the time of the Knights of St John when two Portuguese grandmasters had left a rich legacy that the island treasures to this day. "However, it is surprising that in spite of these constant reminders of Portuguese/Maltese connections and the affinities and shared values of our people, no trade or commercial relationships worthy of mention have since developed," he said, welcoming Banif's presence on the island. He added that the group had studied the Maltese situation for some time before deciding that it was a good location for investment and clearly with space for another operator. "Banif's initiative in Malta demonstrates the group's trust and confidence in our country and in its economic future," he said.